The story of how IFI began in Dayton is truely a story of God’s divine hand bringing the right people together at the right time. In 2011 Gloria Kelios took on a teaching job in the intensive English program at Wright State and during her year there, saw the need for a international student ministry to serve Wright State (and Dayton’s) rapidly growing international demographic. IFI Columbus had been praying for God to send someone to start something in Dayton and through different connections met Gloria and asked her to consider starting IFI there. IFI also connected Gloria with another lady, Mo, who had also felt God calling her to Wright State. Through the university international office’s weekly coffee hours, she met Larissa Swartz, a current freshman Spanish student, who agreed to navigate the student organization regulations to become an official student org at Wright State. Not only did God bring the right people, He brought the perfect place to meet. 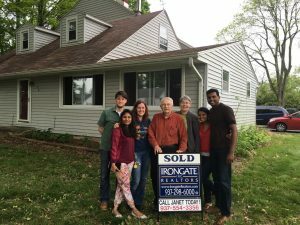 An older couple who used to host international students back when Wright State had a hosting program had been praying for years for God to bring international students back into their house. After meeting Gloria and hearing her vision for the ministry, they naturally offered their house and property for the use of IFI. It had a perfect set up for the weekly meal & Bible study as well as some recreational benefits like a zip line and pool for students to enjoy. So in fall of 2012, IFI Dayton was born with two students at the first Friday meeting, which has since grown to a weekly gathering of 40-80 people. God has always been faithful to provide food for every Friday, cars and drivers for every trip or event, and more, even up to the new ministry house (Trueman) that was purchased in May of 2016.